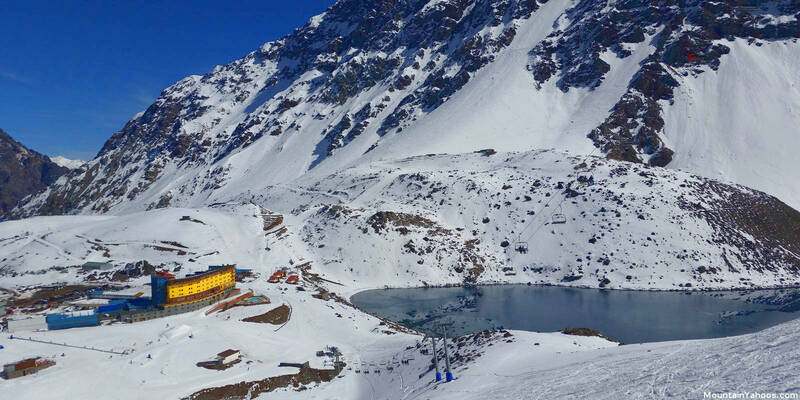 The Portillo Chile ski resort is set in a scenic valley of the Andes Mountains overlooking the beautiful lake Laguna Del Inca with mountain views in all directions. There is no ski town or village, just a large hotel surrounded by a few ski cabins. 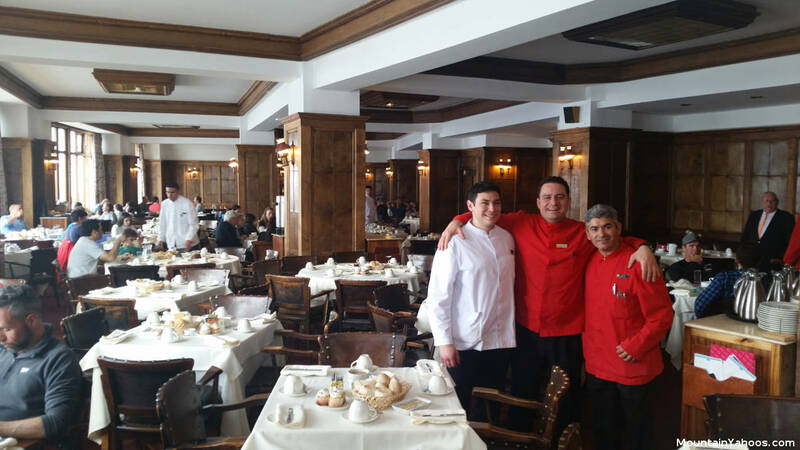 The Hotel Portillo can accommodate your lodging, dining and entertainment needs. Portillo is family friendly, with movie nights, a large outdoor pool, activities (foosball tournaments, poker tournaments, wine tasting, a fitness center, yoga, etc) and nightlife. The hotel ski vacation packages encourage a week stay and are expensive. The surrounding cabins and hostel are cheaper but get booked early. One can save money by staying at a hotel in the town of Los Andes but you will be subjected to a long commute and you will be locked out of the evening activities as the road to Portillo is closed from 8 pm to 8 am. 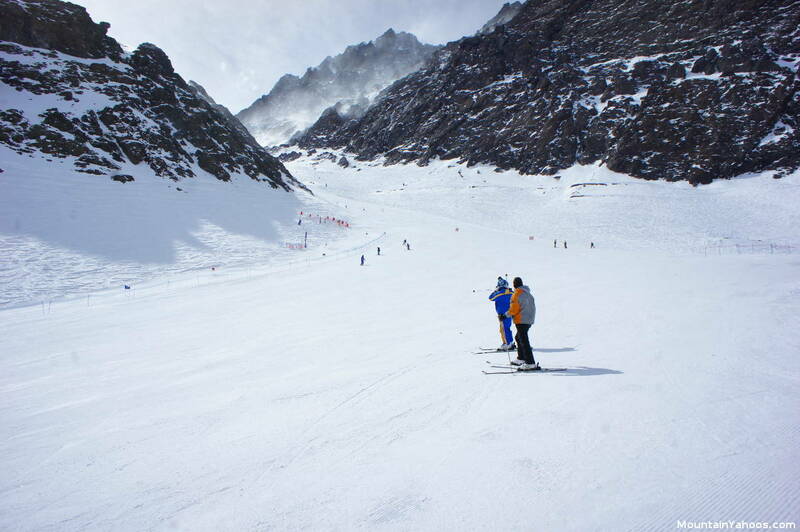 The beginner and intermediate terrain is found at the lower elevations with more advanced runs higher up the mountain. As with any ski resort in the Southern hemisphere, the seasons are the opposite from that of the Northern hemisphere. 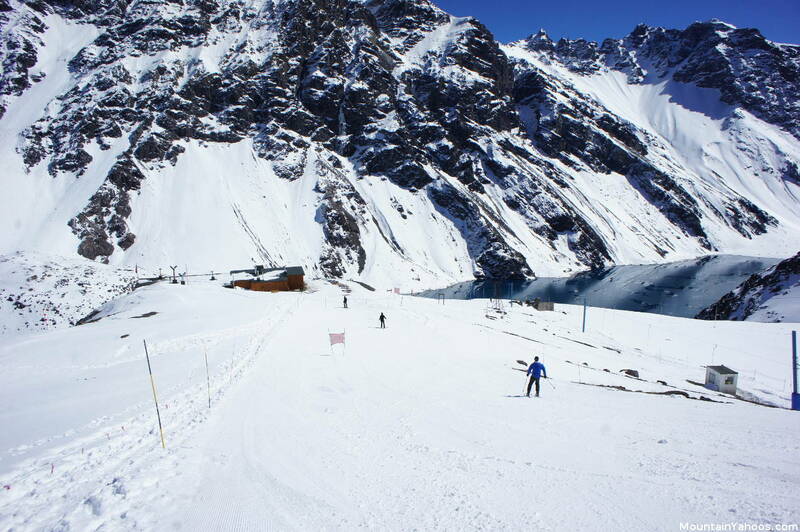 Ski season in Portillo is from late June to mid September. Because of this season inversion, you may see ski teams from around the Northern hemisphere training here in their off season. Portillo is an international destination resort and easily accessible by car, bus or helicopter from the Santiago International Airport. The Portillo terrain is divided into three distinct regions as viewed on the trail map: the left, the right and lower terrain. All the advanced terrain is at the upper elevations and serviced by the unique "Slingshot lifts" which are Poma surface lifts for five. 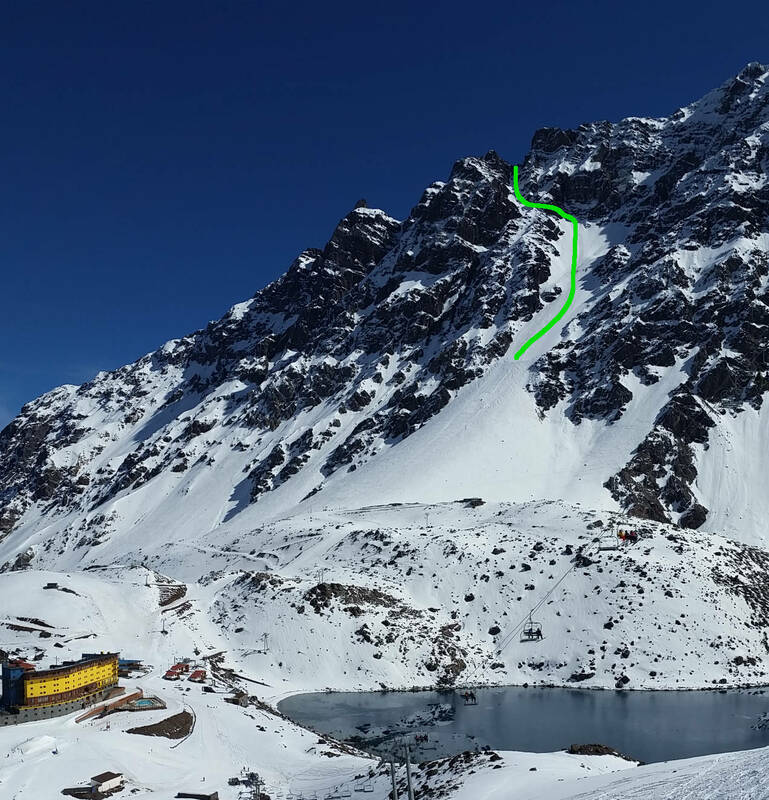 This lift was designed for Portillo terrain and is meant to survive an avalanche because it requires only two lift towers, one at the top and another at the bottom. There are no towers in the middle which could be taken out by an avalanche. The hotel capacity of 450 people and a few other shared housing cabins limits the skier population. You may even feel like you have the lifts and runs all to yourself. Beginner terrain is at the lower elevations with the easiest near the hotel. The most timid should try "Princesa lift" and move on up to "Las Lomas lift". 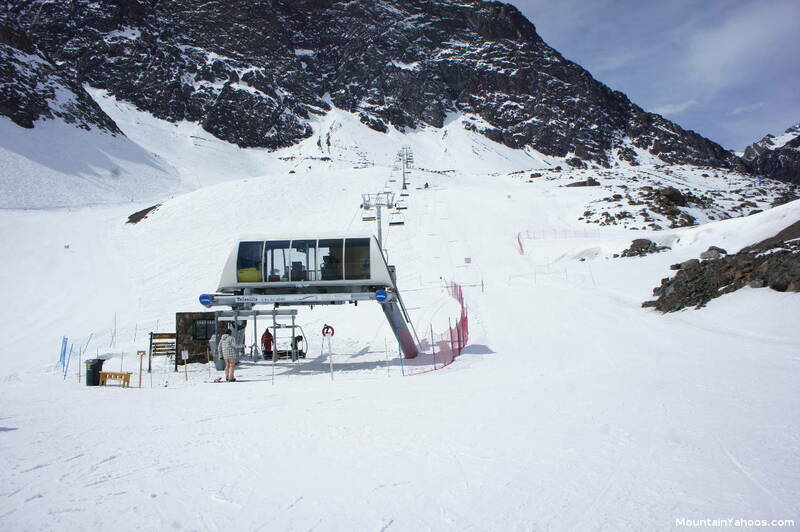 Intermediate skiers can venture to the lower terrain services by the "Juncalillo lift", conditions permitting. 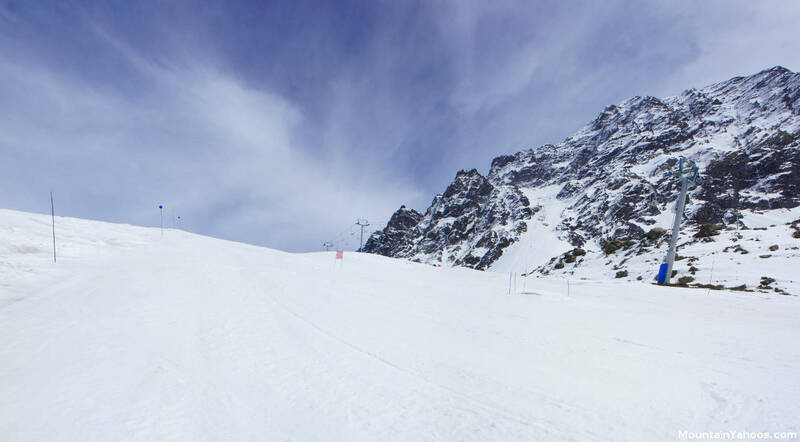 An intermediate level run: "Las Lomas lift" and blue run "Canarios"
An intermediate level run: "Las Lomas" blue run. Take "Los Lomas lift" or "Plateau lift" to catch the run at the top. The upper terrain is home to the advanced runs. 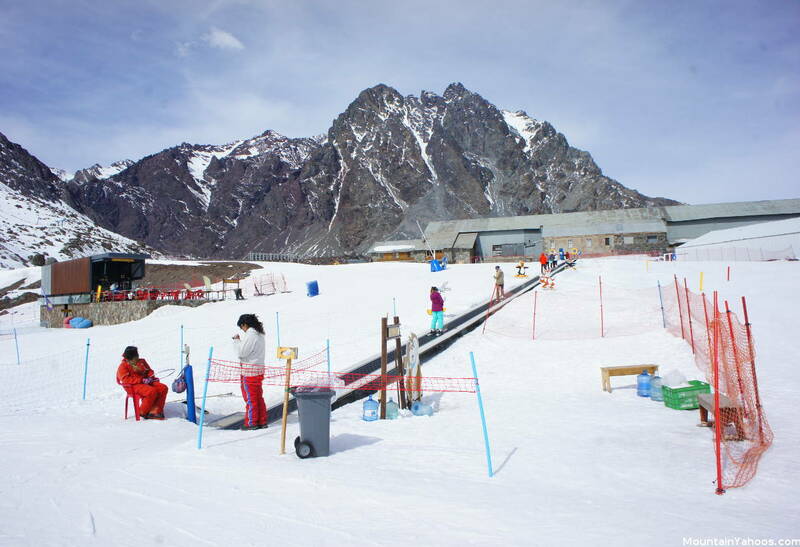 The steepest runs are serviced by the "Slingshot lifts": "Condor" and "Las Vizcachas" on the terrain to the right and the steepest is on the left, "Roca Jack" and "El Caracara". Upper Plateau off of Plateau lift. Stay to the skier's right after disembarking from the Plateau lift and take the traverse on the right to this terrain. Under the cliffs of upper Plateau off of Plateau lift. Notice the traverse to this terrain. The area of the slope in the shade of the cliffs is an area where the snow does not get sunlight and remains powder. Continuing around, one will reach the edge of the run as defined by the rocks. The terrain is steep and has a gorgeous view of Laguna Del Inca. Roca Jack: ride the five in one Roca Jack "Slingshot" poma lift. If riding alone, ride the middle pole and platter. This lift goes up and then reverses to return to the bottom, it does not loop around like a regular lift, thus it goes when the operator thinks you are ready. It does not go to the rocks but goes about 75% of the way up and then stops. 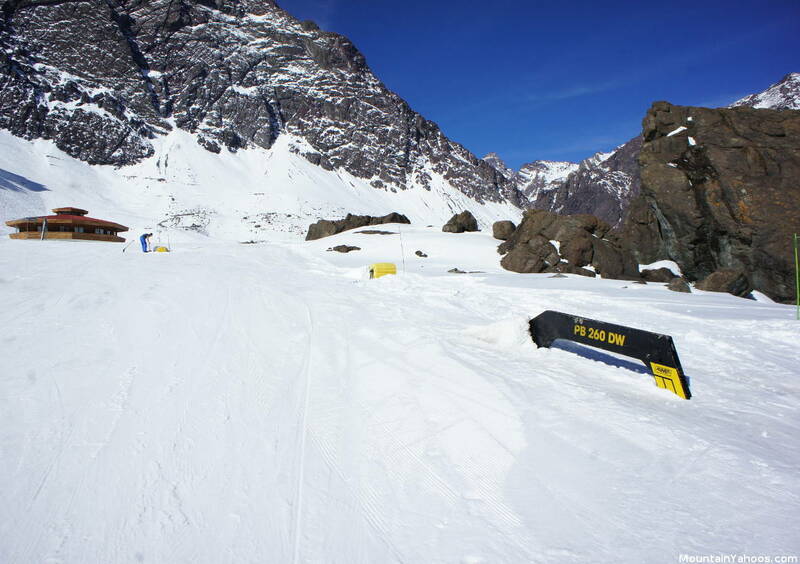 Roca Jack might be the steepest inbound run at Portillo. The stone hut in the foreground is an avalanche refuge. Portillo is above the tree line - no trees. The terrain is steep enough for the development of moguls but we did not find any run that would qualify as "a mogul run". Perhaps it is because there are so few skiers on the advanced runs. 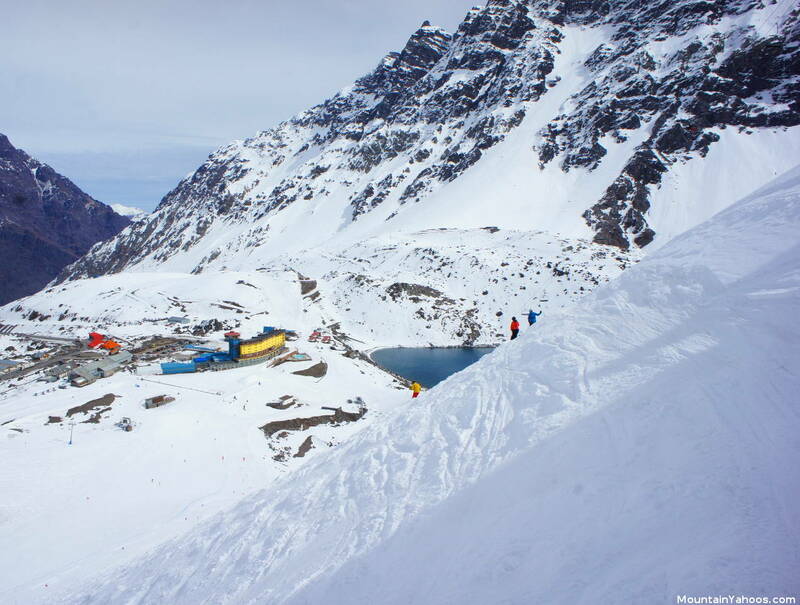 With 1,235 acres (500 hectares) of terrain, Portillo is not a large resort by destination resort standards as the lake and rock formations are physical boundaries, limiting the size and growth of the resort. If you traverse past the base of "El Caracara" lift, there are two hike-able patches, "Kilometro Lanzado" and "El Estadio", as marked on the trail map. There you ski what you hike. 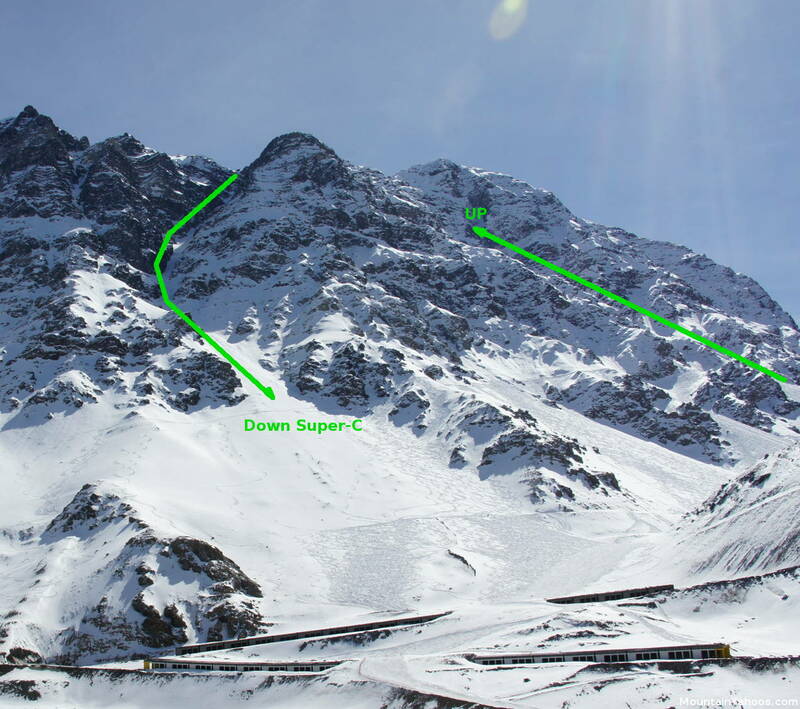 The "Super-C Couloir" is Portillo's one signature chute and it's out of bounds. The journey starts at the top of the "Roca Jack" lift where you continue to hike up to a traverse across the upper ridge to the Super-C Couloir". Check with ski patrol about snow stability as Portillo can have sketchy, avalanche prone back country conditions. The first part from the top of the "Roca Jack" can be skinned and makes up the bulk of the ascent. Crampons may be required later depending on the snow or ice conditions. The most difficult portion of the journey is the traverse at the top where you must traverse the near vertical face with no room for error. This is not a hike for the general public but is an aggressively steep uphill climb for a rewarding run of 5,600 feet (1,706 meters) of vertical. Plan your time accordingly as it is a time consuming hike which will take most of the day to accomplish (be the first on the lift not the last at the end of the day). 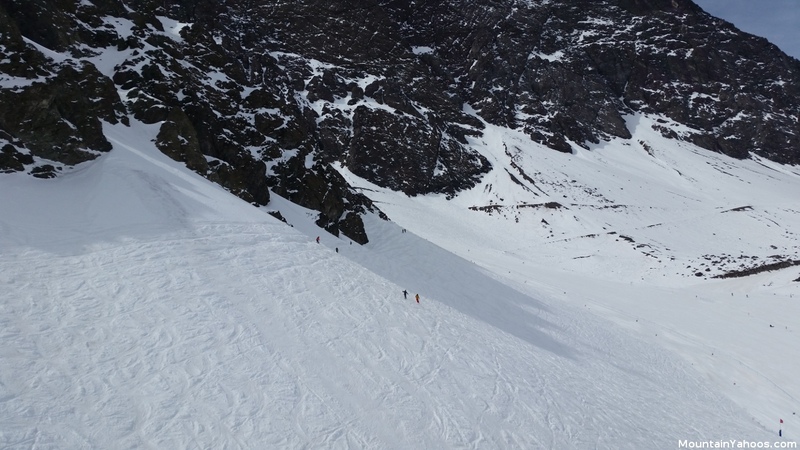 The couloir is scenic, long and steep as well as wide enough to make it ski-able. The return should take you to the bottom of the "Juncalillo" lift. Extremely scenic resort nestled in the majestic Andes mountain range. Family friendly resort with activities for all. No local town. Closest town has resort access blocked during the night. 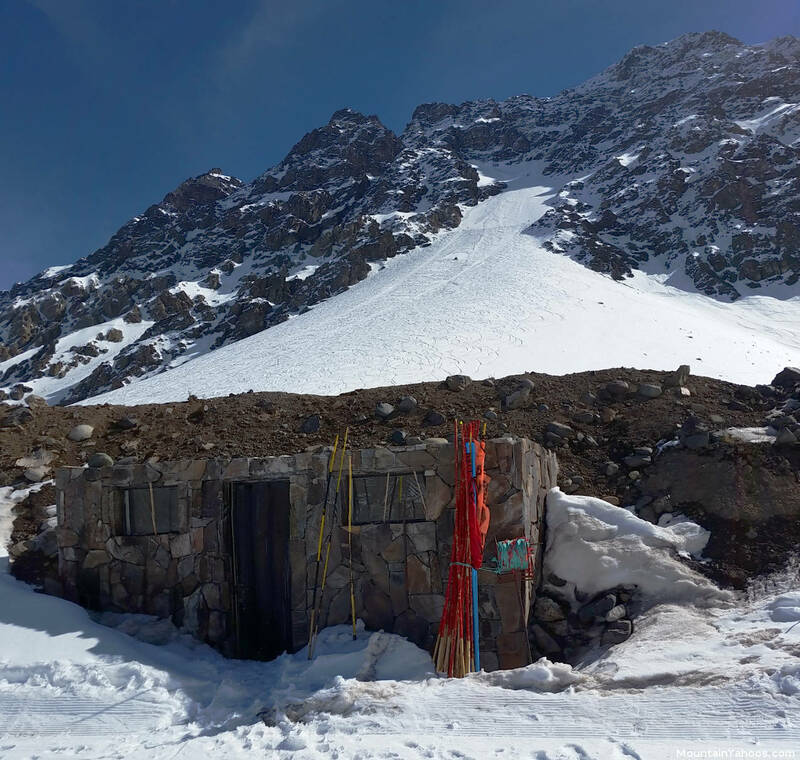 Hotel Portillo has accommodations by the week and is expensive. Too long for a resort this small. There are no official terrain parks but this rail and roller feature do exist. 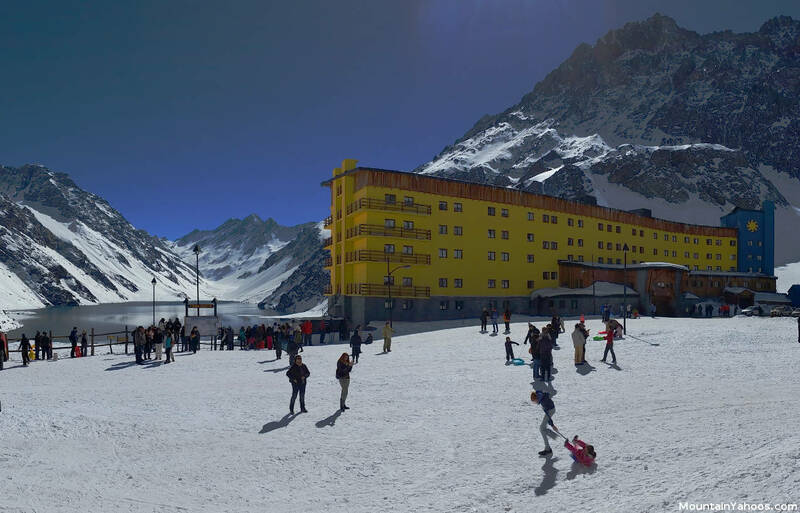 The iconic and defining images of Portillo show the big yellow Portillo Hotel. The hotel and related cabins scattered around the mountain base provide the accommodations for this mountain. There is no additional ski town or village.